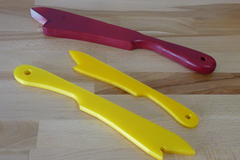 This is a push stick for use with table saws, routers and other tools. Use the push stick to prevent injuries. Remember better safe than sorry ;). There a two versions available. The simple one is easy to print and shouldn't be a challenge for any 3d printer. The complex version is smoother to touch but depending on your printer it might be difficult to print. There is a normal version and a smaller version which should fit printers like the Ultimaker. Also, I added a .dxf file. Stay safe.